When the going was good in the Premier League last season, Burnley boss Sean Dyche and his players insisted that they were simply taking things one game at a time. However, with just one point accrued from five top flight fixtures this term, the Clarets must surely be looking at the next three fixtures in the league with extra interest. A 1-0 defeat to Wolves in the Midlands kept the club stuck in the bottom three, alongside West Ham and Newcastle United, and without a win at this level in 10 games. Eddie Howe's in-form AFC Bournemouth are up at the weekend and then, following a Carabao Cup tie against Burton Albion, it's Cardiff City and Huddersfield Town who are next up on the agenda. Following Burnley's frustrations in the home leg of their Europa League play-off against Olympiakos, the Clarets could probably understand how Wolves's misfortune in front of goal was impacting on them in the first half at Molineux. Dyche's side just couldn't beat the door down against the 44-time Greek champions at Turf Moor last month and, when they did, it was far too late as they trailed to Daniel Podence's opener. It was a similar scenario in the Black Country only it was the home side who couldn't put the game to bed as they failed to make their dominance count. Wanderers, who have only lost two of their 28 home games in all competitions under Nuno Espírito Santo, moved the ball well and at pace, stretching Burnley's back line at every given opportunity. With Diogo Jota, Raul Jimenez and Helder Costa already starting the game in advanced positions, the running of Matt Doherty and Jonny Castro added to their options going forward. Joe Hart had to be at his best to keep out Costa's cross, diving to his right to block after Willy Boly closed in and threatened to get a toe on the ball. The England international did just as well to keep out Jimenez's attempt from point blank range later in the half, after Jota had hit the byline on the left hand side, before James Tarkowski headed the Mexican's follow up off the line. Jonny instigated the next wave when the Atletico Madrid loanee's effort was blocked by Tarkowski inside the six yard box and then Hart denied Doherty at his post as the defender was picked out well by Ruben Neves. The final opportunity of the half fell to Boly when Joao Moutinho's corner was cleared by Tarkowski but the Frenchman's dipping volley cleared the crossbar. Last year's Championship winners should have opened the scoring with the first attack of the second half when Jonny jumped on Phil Bardsley's underhit back pass to tee up Jimenez but the striker, on loan from Benfica, somehow found the stand with the goal gaping. Jota was lucky to avoid a place in referee Andre Marriner's book when throwing himself to ground in search of a penalty having brushed shoulders with Aaron Lennon when trading passes with Jimenez. Hart turned a Neves strike wide for a corner and Jota drilled a shot wide of the upright as the visitors continued to hang on. However, their resolve was finally broken just after the hour. 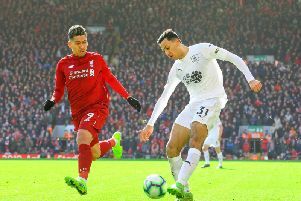 Burnley haven’t won an away top-flight game in the month of September since 1974, when they beat Liverpool, and it was Jimenez who struck to stretch that unwanted record. Doherty got beyond Johann Berg Gudmundsson far too easily to poke Costa's pass towards the penalty spot and Jimenez steered the ball home off the far post. Burnley had barely threatened Rui Patricio's goal all afternoon but they should have had an equaliser soon after they had suffered that setback. Substitute Matej Vydra's volley from Gudmundsson's free kick required the slightest of touches to turn the ball home but, somehow, Jack Cork failed to apply it when unmanned on the back post. But Wolves were worthy of their lead and went close to extending it on a number of occasions. Hart denied substitute Adama Traore with his feet and Doherty side-footed wide as goalscorer Jimenez twice turned provider. Substitute Leo Bonatini was only introduced in the 77th minute but the Brazilian could quite easily have had a hat-trick. The forward's first attempt was cleared off the line by Tarkowski, the 24-year-old then missed the target from Traore's pass when cutting on to his right boot and then he steered wide from close range with just Hart to beat. Gudmundsson's set -piece late on, after Lennon was bundled to the turf, wasn't far off but Patricio watched it all the way as it floated past his upright.